Join us for a special seasonal celebration at Museum of Contemporary Art Santa Barbara on the beautiful Paseo Nuevo Upper Arts Terrace! Mingle with friends, sip festive cocktails, enjoy wine from our sponsor August Ridge, and groove to tunes by DJ Ted Coe (host of "The Freak Power Ticket" on 91.9 KCSB-FM). Beginning at 5 pm, peruse our Holiday Market for art gifts created by local artisans, and visit the MCASB Shop to take advantage of special holiday discounts. Plus, check out the MCASB galleries for a first look at the next two chapters of Bloom Projects artist Beatriz Olabarrieta's Ask the Dust. Curated Cocktails feature unique themes, after-hours Museum access, signature cocktails, and interactive art experiences. 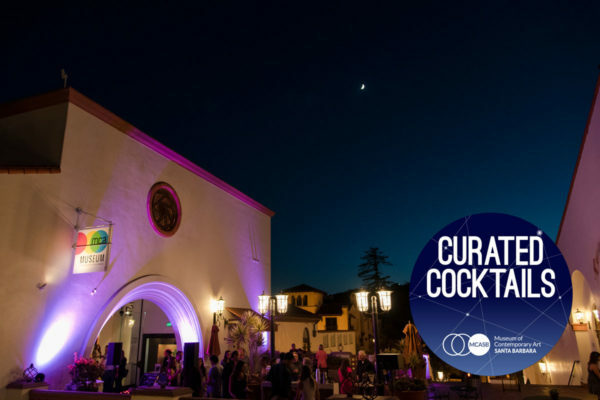 Curated Cocktails are part of Downtown Santa Barbara's 1st Thursdays. Please note early winter hours, 6 - 8 pm. We will resume summer hours during daylight savings months.